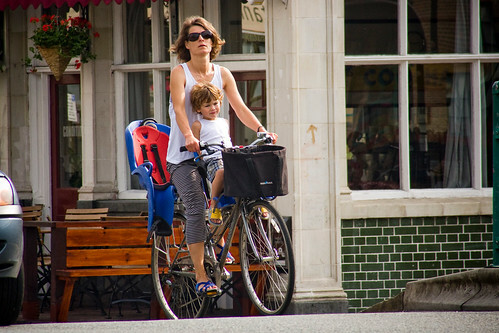 Cyclist in Hackney, London. July 2009. A review of urban transport from the Prime Minister’s Strategy Unit came out yesterday is kind to Copenhagen as a source of inspiration for what may be possible for the UK. It's a big document - 131 pages - and chock full of information. Copenhagen features on two pages of the document. According to the British CTC, "it’s pretty critical and honest in it's assessment of UK transport policy and recommends a massive expansion in cycling and reduction in parking capacity for cars." Copenhagen has a long history of cycle use. A comprehensive and growing segregated cycle network and widespread facilities has helped establish a strong cycling culture. In 2006, 36% of commuters cycled to work, and a target has been set to be the world's top cycling city by achieving at least 50% of people to commute to work or school by bicycle by 2015. The abundance of cycle infrastructure is often cited anecdotally as the reason for the high level of cycling in the city. In the main the network is made up of segregated cycle paths separated from the carriageway by a physical barrier or grade-separation. These have been used in preference to cycle lanes because it is thought to create a feeling of greater safety for cycle uses. Plans are to build a further 51km of cycle tracks by 2016. In addition to the construction of cycle routes, current cycling policy in Copenhagen advocates maintenance and cleaning of infrastructure to improve the comfort of cycle journeys. In addition, integration with public transport is also cited as important and feedback collected as part of the Bicycle Account identifies the need for improved cycle parking at railway stations. The report also mentions Copenhagen in relation to developing a pedestrian-friendly city by creating positive city space since the first street pedestrianisation in 1962. 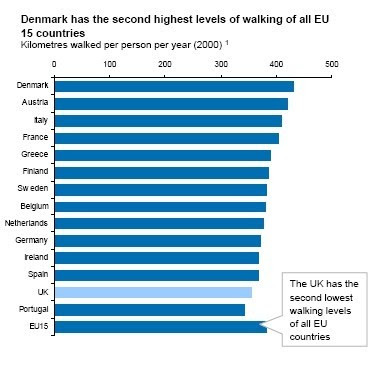 As the graph shows, Denmark is one of the most pedestrianized countries in the EU15. – the introduction of car-free zones and the development of public spaces, such as public squares and urban strollways. – the redesign of older areas to facilitate increased use, including a programme of courtyard renewal. – the reallocation of parking areas to cycle lanes, wider pavements and pedestrian space. The total number of public parking spaces in the inner city decreased by 12% from 1995 to 2005, despite a significant increase in car ownership (11% from 1999 to 2004). In addition to changes in the physical environment, simple measures have been taken to encourage the use of streets throughout the day and evening: for example, shop fronts remain visible beyond opening hours so that streets don't 'close down' when shops finish trading. The whole report is available for download as a .pdf: An analysis of urban transport - November 2009. Thanks to Chris at the CTC for the link.